Retardant is dropped on the fire burning along Springer Creek near Slocan City this morning. It is one of several small fires in West Kootenay that broke out due to lightning. 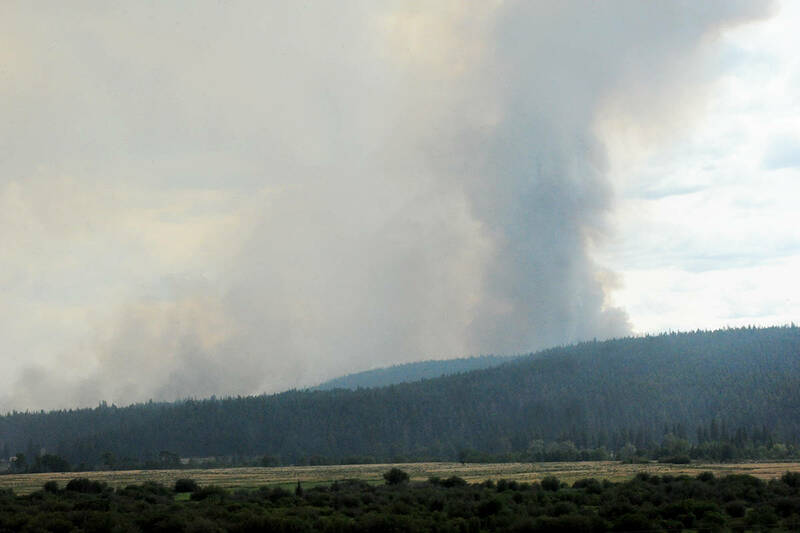 An approximately seven hectare fire is burning on Mt. Aylwin. Jul. 11, 2015 11:00 a.m.
About 35 Silverton area residents who live between Enterprise Creek and Red Mountain Road along Highway 6 (fire numbers 8479 to 9155) have been issued evacuation alert notices. An approximately seven hectare fire is burning two kilometers south of the village and east of Highway 6, near Beaverton Creek and the base on Mt. Aylwin. The BC Wildfire Service is attacking the blaze from the air and ground. The evacuation alert was issued overnight. • Spot fires at Lendrum Creek and Loon Lake, near Ainsworth; the north and south sides of Coffee Creek; in the Six Mile drainage; and at Procter. More thunderstorms are expected through the weekend with spotty showers.